As the second offering in the Alan J. Lerner Musicals in Mufti series, the York is presenting the team of Lerner and (Frederick) Loewe’s first critical success from 1945. 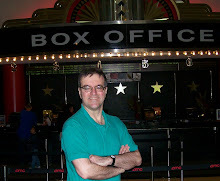 The show had a respectable Broadway run, and Metro bought the film rights, but a film was never made (though “The New York Times” reported one in the works the following year with at least one of the show’s principals, Tom Helmore, set to star) The show was only revived once in the early 1950s in Florida. A later projected film in 1960 from MGM’s Arthur Freed unit would have apparently interpolated songs by Frank Loesser and Johnny Green. For the most part, the show was forgotten, apart from the seven or so published songs (which you can hear nicely performed in laid-back style on the old Ben Bagley “Alan J. Lerner Revisited” album), and the orchestrations by Harold Byrns, said to be excellent, are lost. The enterprising Bandwagon group revived what they could find of the show in 1990. Then York brought back a fuller version in 2007 thanks to the resourceful detective work of then musical director Aaron Gandy. Lerner scholar Dominic McHugh unearthed considerably more material which served as the basis for a 2010 reading in the Lost Musicals series in London. And in 2017, Sheffield University in the UK presented a student production with newly written orchestrations by Matthew Malone. Given all this prior scholarship, one might have expected the current version to be the most authentic urtext script yet, but instead York has opted to do it as a streamlined 90-minutes without intermission, adapted and directed by Marc Acito who had previously adapted Lerner’s “Paint Your Wagon” book for Encores. For not very persuasive reasons, such as the original show somehow not being in touch with the postwar sentiments of 1945, he has reset the show in 1958 (with passing references to the era’s political and cultural benchmarks such as McCarthyism and Davy Crockett caps), and included two nice but extraneous numbers from Lerner and Loewe’s earlier flop “What’s Up?” But even with the addition of those two songs, the overall impression is that there is actually less music heard here than in 2007. The narrative finds neglected wife Katherine (Madison Claire Parks), her head filled with romantic notions after reading her former college flame Alex Maitland’s romantic novel “The Day Before Spring,” persuaded by her husband Peter (Will Reynolds) and their friends May and Bill Packard (Michelle Liu Coughlin and Nicolas Dromard) to attend their 10th year college reunion at Harvardale University (Harrison in the original script). Reluctant at first, but intrigued by the opportunity to meet Alex (Jesse Manocherian) with whom she once tried to elope, she relents. On campus, the husbands meet up with their old buddies Gerald (Jonathan Christopher), Harry (Kent M. Lewis), and Eddie (Ian Lowe), while Peter finds himself romantically tailed by the androgynously named Christopher (Alyse Alan Louis), the kid sister of a former girlfriend. Originally there were extended ballet sequences (courtesy of Antony Tudor, no less), and there’s sensibly been no attempt to replicate those, but the extended first act finale wherein Katherine receives advice from Voltaire, Plato and Freud gives a sense of the some of innovative and fanciful elements of the show. The cast was a bit tentative at the third preview reviewed, but overall equipped themselves admirably given the extremely short rehearsal period. 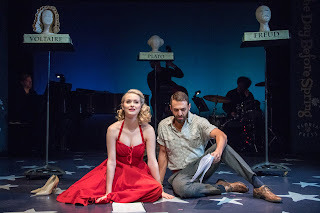 Parks, who revealed during the post-show talkback that she is the granddaughter of Hollywood’s Larry Parks and Betty Garrett, makes a physically and vocally lovely Katherine. Her duets with the well-cast Manocherian, including “You Haven’t Changed at All,” “I Love You This Morning,” and the title song are passionately vocalized. Strong-voiced Jonathan Christopher also make a solid impression as Alex’s assistant Gerald, though I believe Gerald was originally the lovelorn Christopher character’s love interest. Ms. Lewis has been seemingly directed to channel Alex Borstein’s tomboyish Susie character in “The Marvelous Mrs. Maisel,” a choice I found a bit off-putting, but she delivers her two big numbers, “My Love is a Married Man” and “A Jug of Wine” with requisite pizzazz. The show was backed by Music Director David Hancock Turner on piano, George Farmer on double bass, and Buddy Williams on drums. Turner has interpolated some nice jazzy riffs for the ensemble, including Judith Ingber and Brittany Santos. Despite reservations, it’s wonderful that York is giving us the chance to experience this rare work again, and encounter the graceful melodies and erudite lyrics that would soon blossom so spectacularly in “Brigadoon” and all that followed. Pictured left to right: Madison Claire Parks, Jesse Manocherian. Photo Credit: Ben Strothmann.